Super Mario Bros. contains a very secret debug menu which the developers used for testing the physics and behavior of the game, as well as add fun options while they were bored. One of these options includes an "acid trip" mode which is the first known example of procedural generation in video games and the first usage of the "portal gun", popularized later by Valve's Portal series, and served as the inspiration for the completely unrelated fangame Mari0 (of which this is definitely not a TAS of). 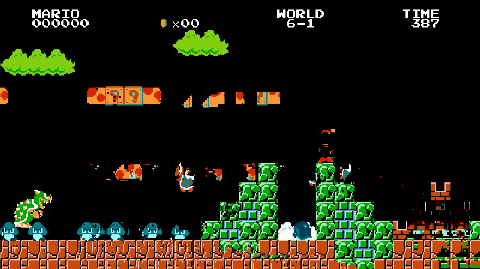 The mode is a joke on Mario's famous powerup mushrooms. Masterjun: Hey you took my super important input without asking. Now prepare for the wrath of a judge! Pipes are not for smoking but for warping. If you feel yourself getting high, don't worry, gravity still works so your jump will terminate at some point and you will get low again. A mushroom person telling you to do drugs is generally a sign that it's already too late. Rejecting due to including dangerous weaponry such as a gun.